As I get older, I value certain characteristics in my life more and more. Two of these are reliability and dependability. Not only in my relationships with my family, friends, and even coworkers, but also with my horse and even the tack and equipment I use. I’m always willing to give new things a try, and if they work well, they become part of the “tried and true” I depend on every day. My horse, Flirt, falls in this category. 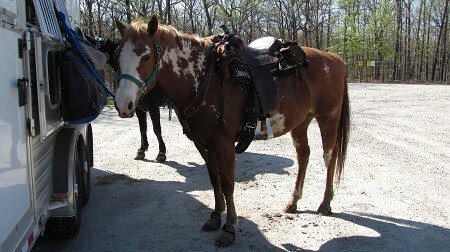 My husband’s horse, Jinx, also falls in this category. 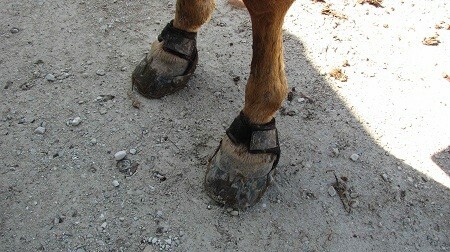 So do the Easyboot Gloves we use on their front hooves, every single ride. We don’t use any boots on their hinds. They are both barefoot, and have been for several years. Although they can probably handle most trails without any boots in front, we like using them for that little bit of extra protection, and not having to worry if we ride somewhere with a lot more rock than is in their pastures. 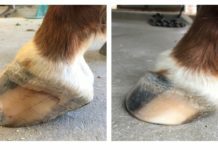 We originally started using Boa Hoof Boots on Flirt back around 2005, because we just could not keep metal shoes on him no matter what we tried. After having the shoer out three times in one week, and still missing a shoe on Saturday, I threw my hands up in the air and was willing to try anything. Boa Hoof Boots seemed like a good solution. They were easy to put on, I didn’t ride a ton of miles, and I no longer had to worry about lost shoes. The Boas performed reasonably well, and I used them until 2010. I was fortunate enough to be selected for the original Team Easyboot in 2010 (and chosen again both in 2011 and this year – thank you, Easycare), and was able to perform some testing in the new Easyboot Gloves. They were revolutionary. No moving parts to break or replace, fairly easy to put on, and boy do they stay on. 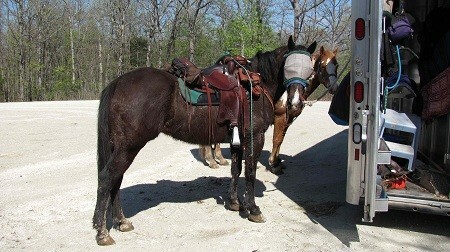 A few years before, I had a barefoot trimmer that stopped trimming due to a back injury teach me to trim our horses. When I had abdominal surgery, my husband stepped up and learned, and to this day does all the trimming. Keeping the hooves in shape for the Gloves is never an issue for us, and we have never had a Glove fail us. The closest we’ve come to one “failing” was due to poor fit. We had let Flirt’s toes get a bit too long, and his Gloves were fit to that hoof size and shape. As we corrected that runaway toe, his boots became a bit too big and started to occasionally come off. 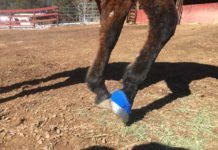 We found a few wraps of athletic tape around the hoof allowed us to keep using those boots until I could get a Fit Kit and confirm his smaller size. We’ve also been able to depend on these Gloves to perform duties outside what they are recommended for, and perform well. 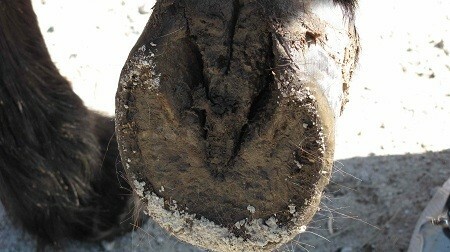 Flirt had stepped on one heel bulb with his other hoof when he got tangled up on the trail in a badly eroded hill. He walked off without any indication something was wrong, and since he had his boots on, I never thought to get off and check. 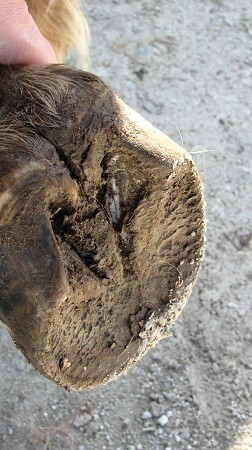 We rode about ten miles that day, and back at the trailer we discovered he had actually split his heel bulb open about ¼” wide and deep, and about 1” long. I rinsed it with saline, put a clean bandage on it (no ointments), secured the bandage with tape, and put the boot back on. I hauled him home and called my veterinarian. After explaining the wound and my treatment of it, my veterinarian said he couldn’t do anything more than I had done, and to keep it clean, change the bandage twice a day, use antibiotic ointment, and keep using the Gloves for turnout to help protect the area. 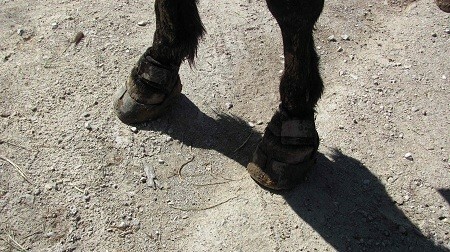 For approximately one month we followed this protocol, sometimes leaving the boots off during the night so his hooves would have a break. He never had an infection, never took a lame step, and the boots showed no wear and tear from this usage. This obviously falls outside the normal recommendation for these boots, but I was absolutely delighted with how well they worked. 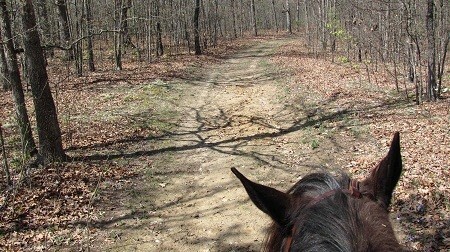 Just today, after giving the horses the winter off, we hooked up and hauled to a local trail for the first trail ride of the season. 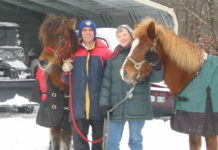 I took all of my reliables and dependables with me: my husband, our horses, and of course our Easyboot Gloves.